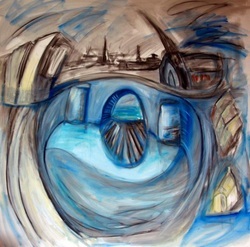 John Maher has been described as a "thematic" artist. A unifying or dominant thread is carried throughout his work. 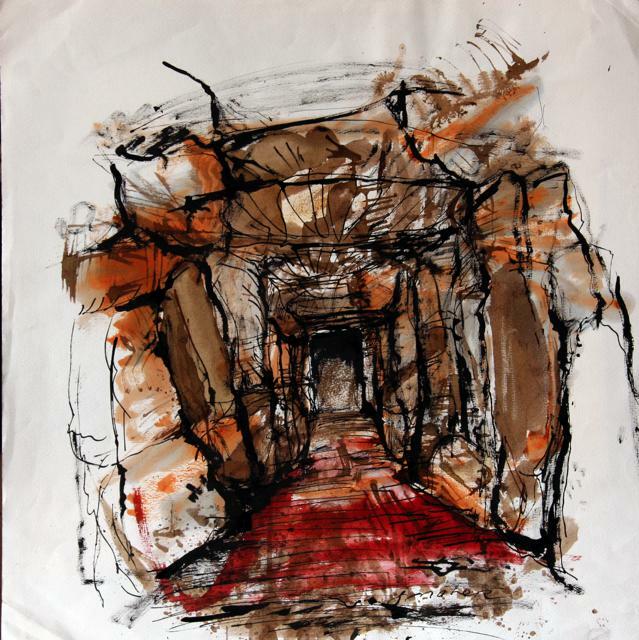 These specific themes will be explored through his paintings and drawings aiming to interrogate in their visible and narrative sense. Maher will go beyond that which is ordinarily explored, often visiting the unpresentable with consideration of what exists inside and outside the frame. Among these collections we experience his passionate interest in peace, mythology, memory and travels as well as a range of interesting often complex material covering some fifty years of painting. Painting in Ireland Maher found it impossible to ignore the influence of Celtic literature, graphic imaginary, iconography and poetic thought. He also embraced the writing and philosophy of his earlier contemporary influence James Joyce. "If asked in the 60's or 70's what is Art? The answer would be be "that which Joyce says is Art"
In Maher’s paintings we find a similar open tone, the newness of the arbitrary, a nuance towards things outside the frame. He often recalls memories from his early childhood latterly his extensive travels in South America, Africa and Asia. He recalls this was his attempt to avoid the "paralysis of Dublin". This artist’s methods in confronting and creating work which could have been made by a number of artists arises in part from from Joyce's profound influence. This artist’s signature style is to be found behind that variety and myriad of influences . seemed to be no end to tribal warfare in the last quarter of the twentieth century. 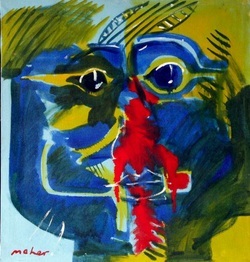 It is probably one of the few attempts in modern painting to depict pain for a cause. This artist is acutely aware of the pain of war and violence in two world wars, Nazism, revolutions in Russia and much anticolonial conflict. The SOLSTICE series grew out of several visits to the standing stones and passage grave at the Megalithic site in Newgrange, near Dublin, Ireland. This Unesco World Heritage site is where the December solstice is marked by the occurrence of a beam of light from the rising sun. This strikes the back wall of a central chamber at the end of a long tunnel. Maher remains intrigued by this evidently religio/scientific understanding of the Celtic and pre-Celtic communities. human memory and its representation. By means of a long and earnest series of works on the nature of art and memory, a topic which has concerned many philosophers from Plato to James Joyce, Maher understands the unreliable nature of visual memory. What happens when a subject is recalled and then depicted? And what happens when another similar depiction is made - now with the first image as well as its new depiction also as part of that memory? Mahers work on recalled imagery and his drawing out this on the subject of the town of his birth in Dublin (while living on the shores of Lake Geneva) led to much interest in his work in Continental Europe. ANNIVERSARY PORTRAIT OF LUKE KELLY is part of a series of engravings made at the Taller Con Tinta Roja studio by John Maher in collaboration with the Spanish engraver Ana Matías in Marbella. His engravings covered a wide rang of subjects including portraits, still fife , aircraft and figure drawings. As in the paintings the expression of art as a world of ideas is evident giving the work a striking energetic originality. 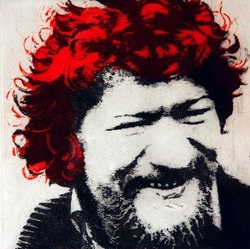 Luke Kelly was a remarkable singer in the folk tradition. 2010 has recently marked, sadly, the twentieth fifth year anniversary of his untimely death.